So we know that the V-One only supports .8mm pitch footprints but can do .5mm pads for solder paste and can drop 8 mil ink lines. I have been toying with the idea of making custom footprints that don't use pads but only lines. 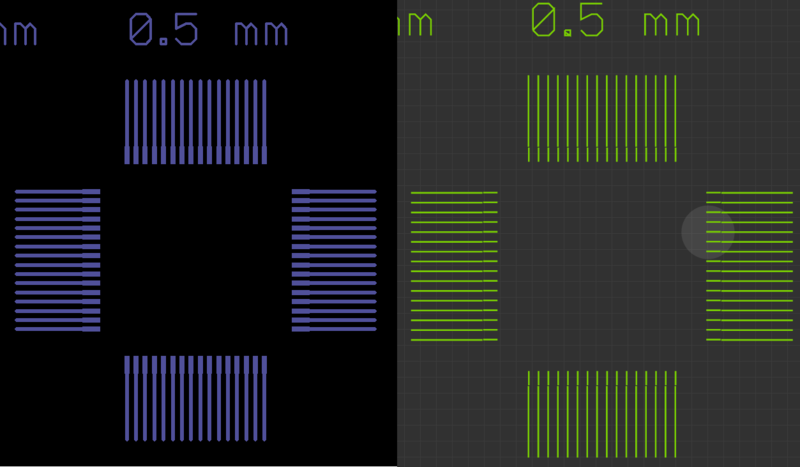 I really want to be able to mount .5mm and maybe even .4mm devices on ink printed circuits. Fine pitch breakouts... did you see this recent post? If all pads are separate, could we just print over them? I think the v-one is expecting uniform height to start and takes into account traces it lay's down so I am not sure if you could use that type of proto board? Folks at Voltera, are pads always printed as rectangles? Right, since i want really fine pads, I don't want to use pads if the V-One will always print rectangles, I want the V-One just to print thick lines. I was experimenting in Eagle. I have not attempted to print this yet. This is a 48 pins .4mm footprint on the inside and a larger 80 pin .4mm pin spacing on the out side. Example chips are Espressif ESP32 and Wiznet W5100. Sweet!~ Do you have any chips you can try mounting? 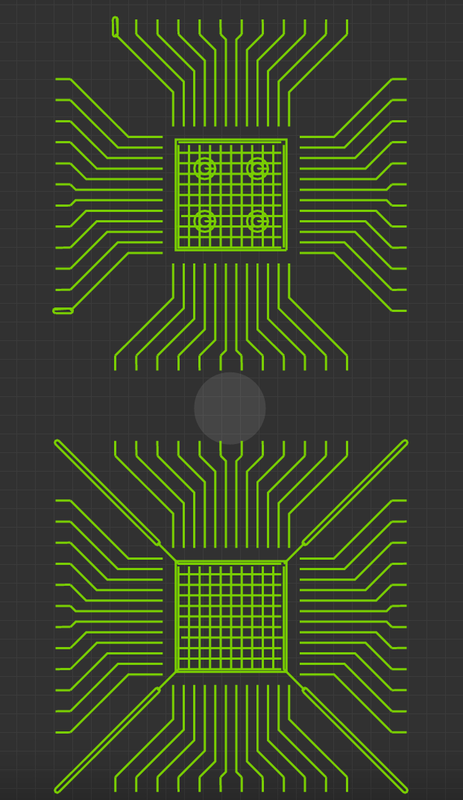 If you look carefully, you'll notice that the 'pads' and the traces are at a slight offset from each other. The traces will be printed on top of the pads. This would result in more ink dispensed and potential shorts. 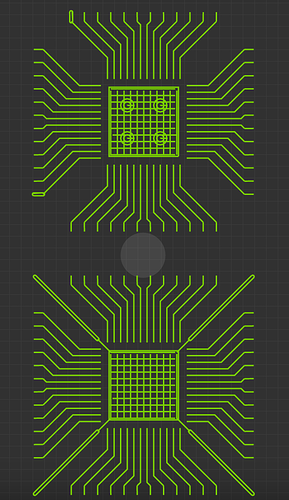 The ideal solution is to merge the two lines so that the pads look like the footprint @a2retro designed. We already have plans to add this feature, but it is not exactly trivial so I can't say when it will be completed. Looks like default forum permissions only allowed images. I've changed it to accept Gerbers as well. By the way, @emcniece - I loved the 'action' shots in the youtube video. 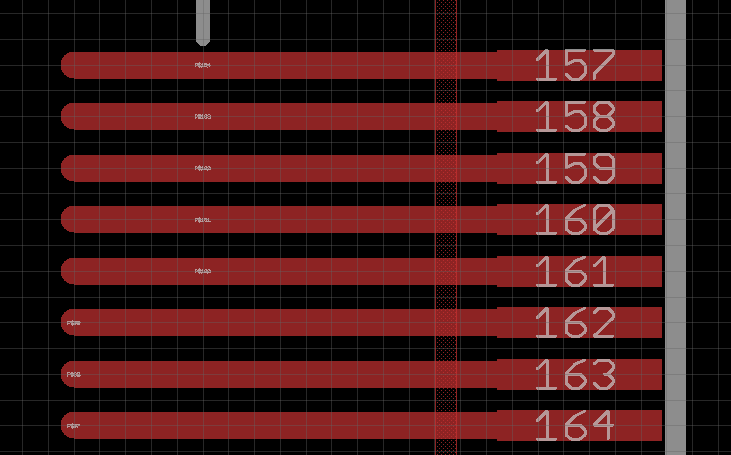 So with the new algorithm for fine-pitch pads, the $10M question: does this allow the V1 to go down to 0.5mm spacing for IC's? 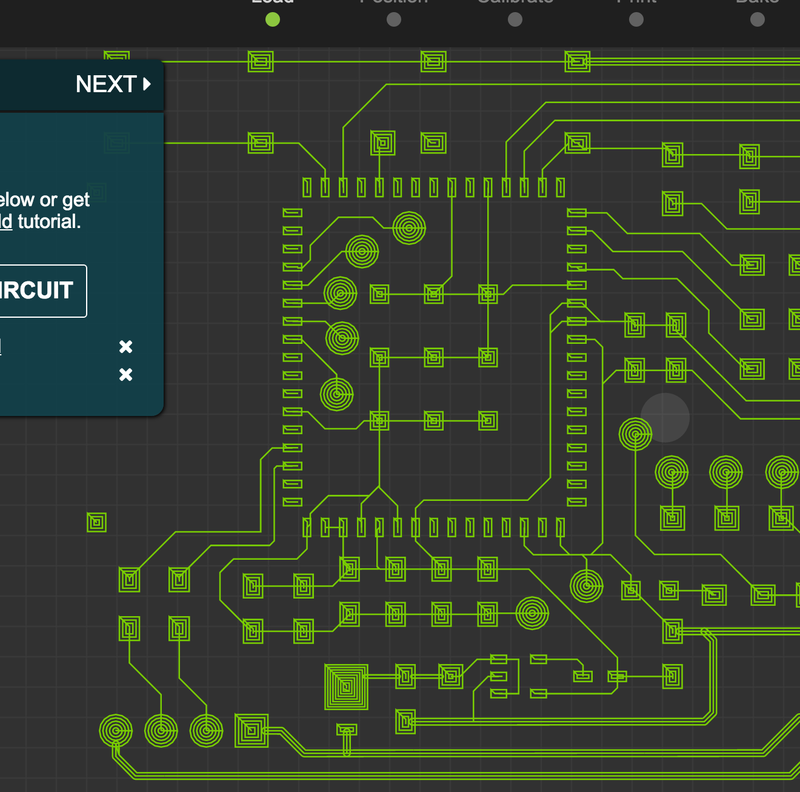 I'm looking at prototyping a board that has a 208-pin PQFP package on it. 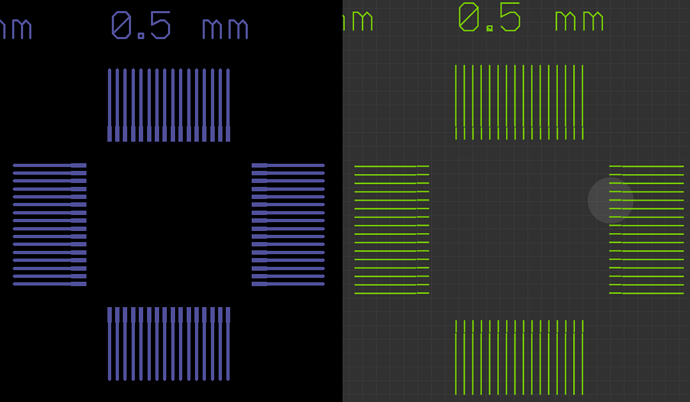 I know I can mill this and the V1 is spec'ed to be able to solder-paste down to 0.5mm, and is my Plan A. 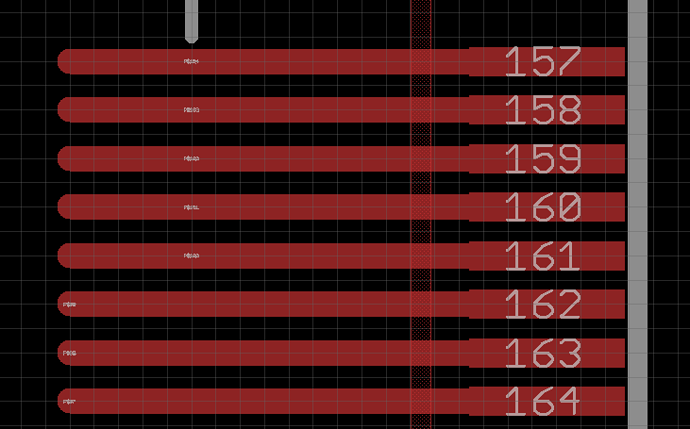 While I may still go that route, it would be useful to know if in the future I could consider doing it all on the V1. 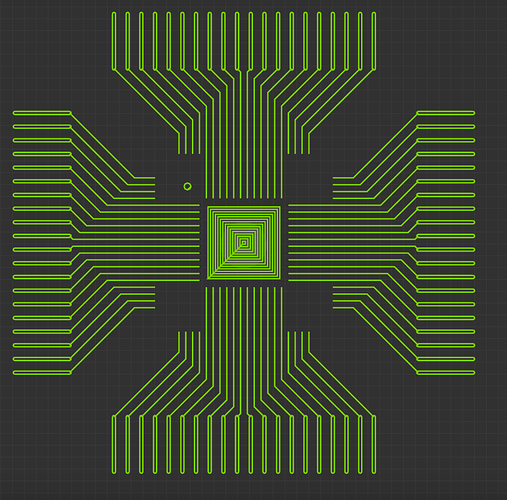 I know @emcniece is doing some interesting research with pushing the pin pitch envelope, but I get the impression it's not as simple as using stock package templates (i.e., from Eagle) and watching a 0.5mm pin pitch footprint magically appear. Not sure if this is close enough, but I successfully printed this footprint already. Initially the printed pads were merging, but the v0.6.2 update cleaned the print up a lot. Forgive my ignorance, but wouldn't that footprint be considered 1.00mm pitch? I'm looking at the "1.00" directly above the "0.60" on the upper right of the pads. 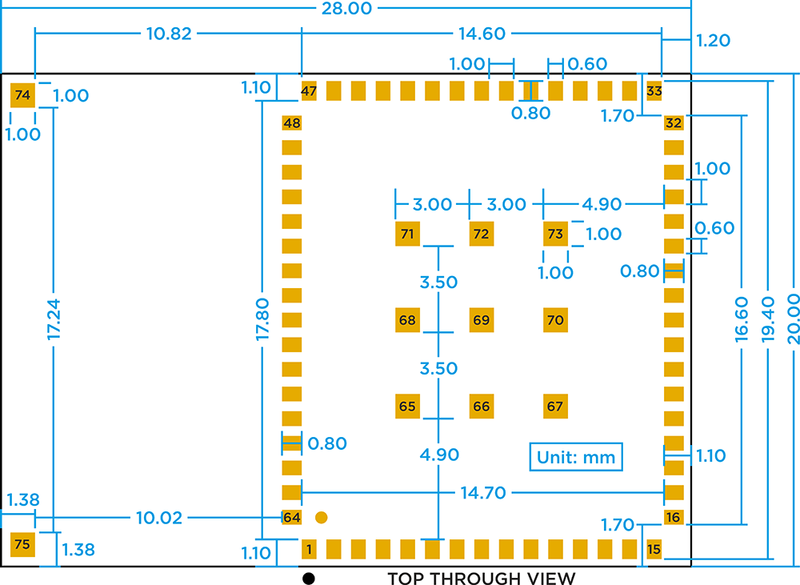 The datasheet for the 208QFP package I'm using shows a dimension "e", which is similar to your 1.00mm except measured on-center, and the value of "e" is listed as 0.50mm. That's correct - the pin to pin pitch of the above footprint is 1.00 mm. A well tuned V-One should be able to print that well. Our current specs for printing are 0.8mm pin-pin pitch, printing finer than 0.8mm might be possible in the short future, however components would have to be attached by solder paste & reflow. Hand soldering to that pitch will prove to be quite difficult and I would not recommend it. Good to know. I will be trying to V-One reflow first and if I have any issues I'll fall back to my homemade reflow oven. Ditto, good to know. And hand-soldering a 208QFP chip wasn't exactly on my list of things to torture myself with. @DavidYon47 I will be making a PQ208 custom footprint. I will post the file when I have it completed if your interested. @jazozaya I see what you mean about the merging of the two. 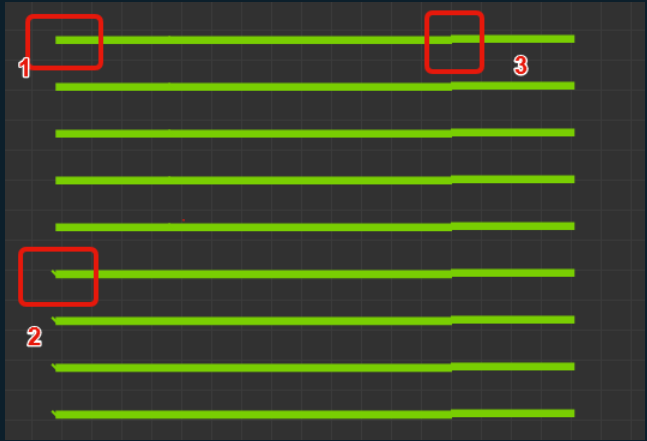 I am hoping you can implement that sooner rather then later but in the mean time I will build some alternate footprints for current projects in the pipe. and here i have joined new style footprint on the left to a stock PQ208 footprint on the right. Where they meet it is clean but where it connects to a stock footprint we get the bump. I am guessing that at .8mm and above that has not been an issue. So we got a chance to work on some fine pitch goodness today. 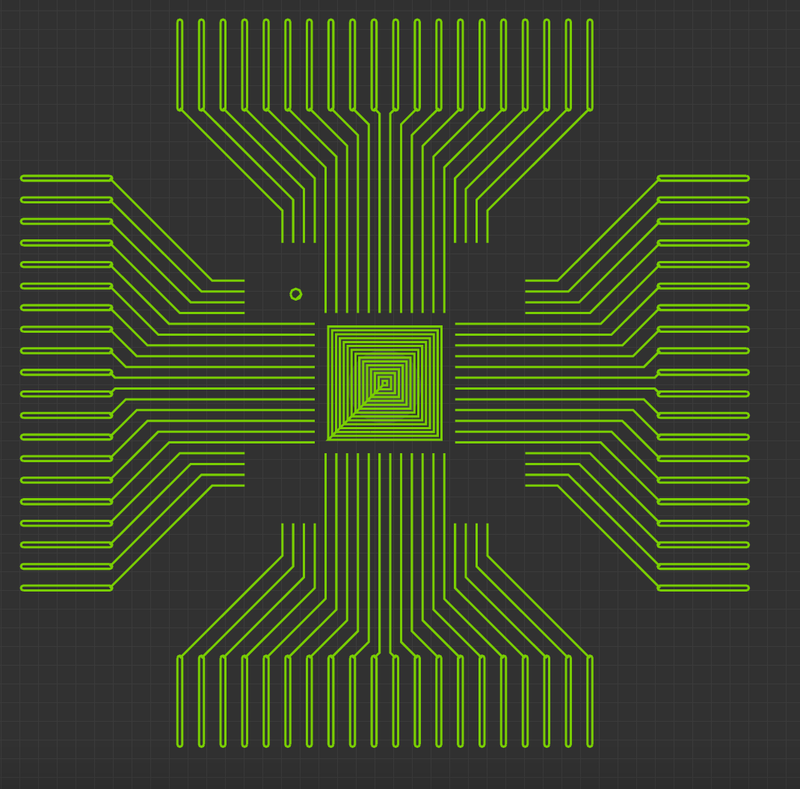 I made some small tweaks to the algorithms so that single pass lines are actually truncated at pads. What this means is that they will not enter the outline of the pad, and if they do, they will enter by the tracepad_penetration_ value in the settings window. This prevents the V-One from double dispensing on fine pitch pads. Double dispensing is bad as it leads to shorts. If you look closely, the traces and the pads are now being drawn as two separate lines that are almost touching. 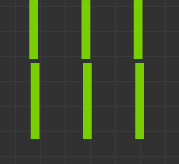 The pads are still a tiny bit offset from the traces - this is actually a trivial bug and is next on my list. The print looks quite decent and at first inspection it doesn't look like there are any shorts. The board is currently baking so we'll have to update you on how it turned out. The next steps are to merge the pad and traces together to form a single line and then to try dispensing solder paste and reflowing some components on.